The Lakers got their table-setting point guard in Lonzo Ball, who has the ability to spoon feed baskets for others but with Isaiah Thomas and Kentavious Caldwell Pope facing free agency, the team needs to add another off the ball scorer. If the Lakers want to add a cheaper piece via free agency in order to put money aside for a bigger free agent, Marco Belinelli is an option. Bellinelli fit in seamlessly for a young 76ers team after coming to Philadelphia midseason. If the Lakers use their 25th overall pick on a scorer, UCLA’s Aaron Holiday, who played with Lonzo in 2016, could provide depth behind Ball and play off the ball when he plays point guard. The Lakers will be in the Paul George sweepstakes this offseason. Even if the Lakers sign George, they will still have enough money to offer Julius Randle a long-term contract. Randle is coming off his most efficient season, averaging 16 points (55-percent FGs) and eight rebounds per game. If LA chooses to add some depth along the frontcourt with its 25th overall pick, Kentucky’s Jarred Vanderbilt could be worth a shot. Vanderbilt is a left-handed power forward with good position versatility, athleticism and -at times- can’t help but remind you of a young Lamar Odom. The Clippers had a lot of young players step up despite losing Blake Griffin. Players like Sindarius Thornwell, Milos Teodosic and Tobias Harris can serve as the new faces in the rebuild around DeAndre Jordan. Los Angeles also has capable three-and-D players like Wesley Johnson and Sam Dekker under contract. However, the Clippers could stand to add an athletic power forward to spell Harris in small ball lineups. With the 12th and 13th picks, LA could go in a few different directions but Kentucky’s Kevin Knox fits the mold of a strong but athletic forward. The Clippers could bring in Knox with the 12th pick and use the 13th pick on the best available prospect, which could be anyone from Alabama’s point guard Collin Sexton to Missouri small forward Michael Porter Jr. If the Warriors showed one weakness it was when Andre Iguodala went down to injury. Coupled with the earlier injury to fellow wing Patrick McCaw, Golden State needed another wing defender. The Warriors will bring back Kevin Durant but it remains to be seen what else they will be able to add in free agency. If Golden State looks to the draft with their 28th overall pick, then SMU’s Shake Milton is a name to watch. Milton shot 43 percent from three-point range last season and owns a 6’11” wingspan. Milton also averaged four assists and four rebounds per game. The former Mustang would be a welcome addition and could develop into a three-and-D prospect capable of defending multiple positions. Justin Jackson is the only true small forward under contract. Sacramento has the second and 37th overall picks in the draft. If the Kings want to add a wing early in the draft, Luka Doncic from Slovenia would make sense. Doncic is a polished player and at 19 years old, he has not yet reached his ceiling. However, if Sacramento wants to grab a big man and come back in the second round and add a wing player, Kansas’ Sviatoslav Mykhailiuk is a 6’8” sharpshooter. He has shown before that he can play well alongside former Kansas Jayhawk and current Sacramento Kings guard Frank Mason, Jr.
Willie Cauley-Stein, Zach Randolph and Kosta Koufos have one year each remaining on their contracts. Sacramento could look to add another big man who could play alongside Cauley-Stein, stretch the floor and play both the forward/center positions. With the second pick in the draft, Duke’s Marvin Bagley, Jr. would make sense. He has room to improve defensively but he could play beside Cauley-Stein and they could both help each other's deficiencies. Phoenix has the first and 16th picks in the first round. Tyson Chandler is the only true center under contract and he will be 36 years old by the start of next season. Arizona’s Deandre Ayton played right down the road and is the consensus best prospect in the draft. Ayton is a 7-foot-1-inch, 250-pound 19-year old with an NBA-ready body. Ayton averaged 20.1 points per game last season along with 11.6 rebounds. He also possesses a decent jump shot to go along with a back to the basket game. With Ayton and young SG Devin Booker, Phoenix would have a strong foundation to build around. 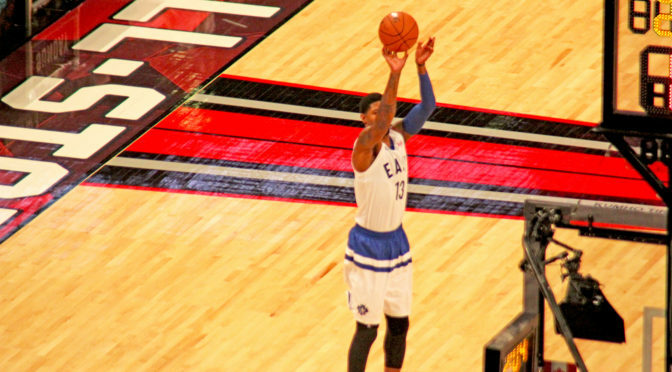 Elfrid Payton turned in his best season last year, averaging 12 points per game, six rebounds and four assists. Payton also played 28 minutes per game last season, splitting minutes with a host of players (Troy Daniels, Tyler Ulis and Mike James). If the Suns choose to add a big man with the first pick, look for them to come back 15 picks later and try to address the depth in the backcourt. Miami’s Lonnie Walker IV is 6’4” and has a 6’10” wingspan. His size will give him some position versatility defensively at the next level. 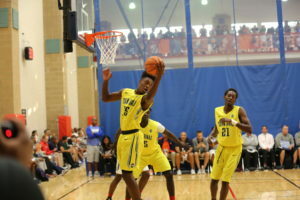 Miami (Fla.) G Lonnie Walker IV (pictured for Team Final during the 2016 Nike EBYL Peach Jam) averaged 11.5 points per game for the Hurricanes in 2017-18 and shot nearly 35-percent from three-point range. Coupled with his scoring potential (11.5 points per game), Walker could be an intriguing pick to log guard minutes behind Ulis and Booker next year. --- By: Troy Jefferson, DraftNasty Staff reports, Follow him @troy_jefferson on twitter.